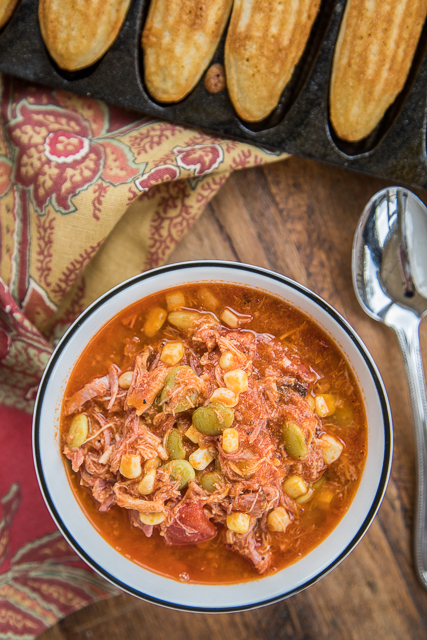 Quick Brunswick Stew - ready in 20 minutes! 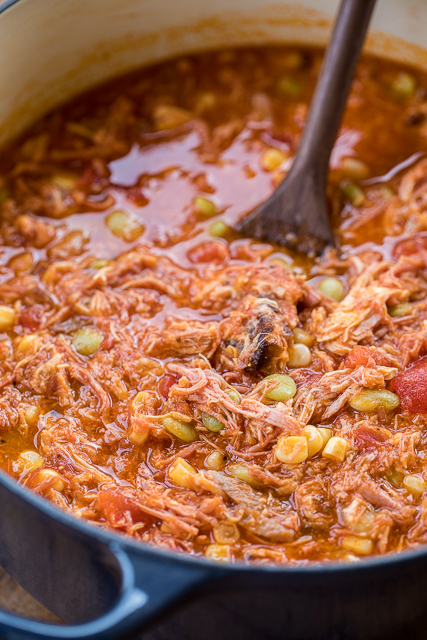 Pulled pork, chicken, lima beans, corn, chicken broth, BBQ sauce, tomato sauce - throw in the pot, bring to a boil and simmer for a few minutes. SO delicious! We made this two weeks in a row. We couldn't get enough of it! YUM! I've made this stew twice in the last month. I love it. This recipe can be ready in about 20 minutes. 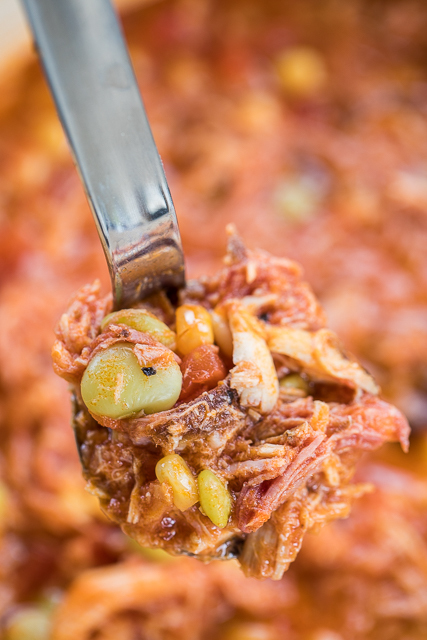 I bought some pulled pork and BBQ sauce from my favorite BBQ joint for this recipe. I also used half of a rotisserie chicken in this. You basically dump everything in the pot, bring it to a boil and let it simmer for about 20 minutes. If you want to cook this in the slow cooker, I think that would be fine. You could even use a couple of uncooked chicken breasts and just shred them once they are cooked. 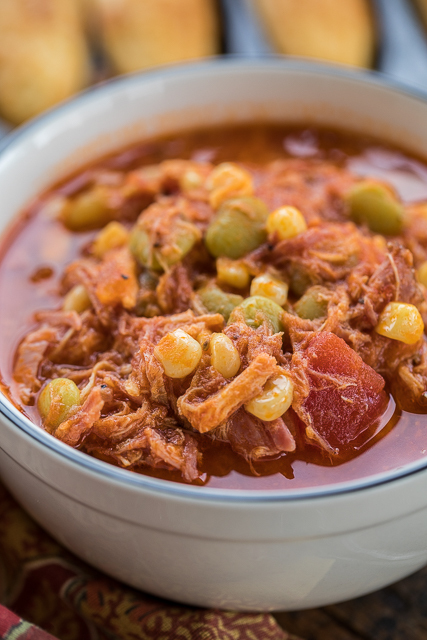 Make sure you enjoy the BBQ sauce that you use in this Brunswick stew. It really adds a lot of flavor, so you want to make sure you like it. 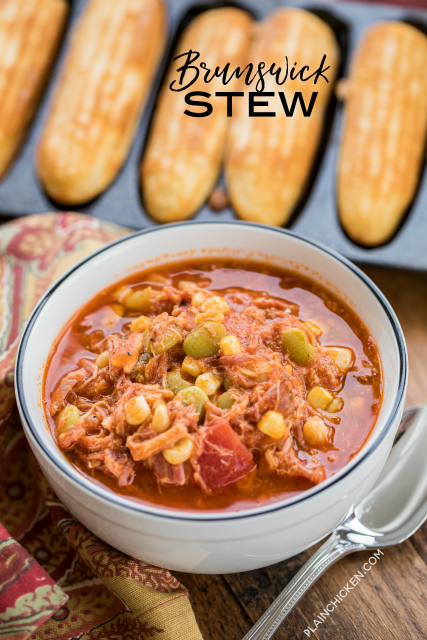 This stew is great leftover as well. We ate it for dinner and lunch a couple of days. One note on reheating the stew. You might have to add a little chicken broth to the leftovers. The broth kind of gets absorbed by the veggies and meat as it sits in the fridge. If you don't want to get pulled pork from a BBQ place, I've made this with Kirkland Pulled Pork from Costco and it was AMAZING! It might be better than your BBQ joint! Add all ingredients to a Dutch oven or large saucepan. Bring to a boil. Reduce heat and simmer for 20 minutes. I made this for supper, and used onions instead of corn (allergy). It was quick, easy, and really good - ad it made a lot - y neighbor liked it too ! Thank you ! I made this yesterday and it is delicious! Before starting, I added a little oil and fried a medium chopped onion then did everything else as recipe calls. I used 3 cups of chicken broth and also added a can of diced potatoes. Won't be sorry in trying this recipe as with many of Plain Chicken's other recipes. Love your site. Thanks!!! This is one of those recipes you don't think sounds (or looks) too good, but, oh mama, it is delicious. Thanks.